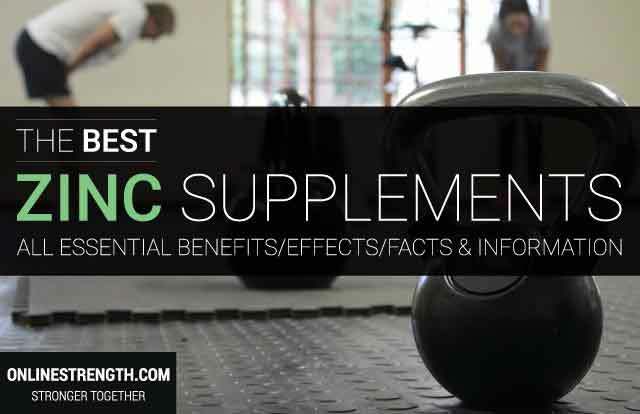 Onlinestrength analyzed 10 best-selling zinc supplements in the United States for zinc content (zinc acetate, zinc citrate, zinc gluconate, and zinc sulfate, or zinc monomethionine) and additional (preservatives, fillers, or artificial colors, flavors or fragrance) ingredients. Zinc is one of the 12 essential minerals required by your body for proper growth and development and its one of the few nutrients a number of people are deficient in. Zinc is very important and vital for immune system functionality. Zinc supports brain function, aids healing of wounds, vision, and immune system health. Zinc can be supplemented to replenish and restore depleted zinc levels. Athletes supplement zinc for its immune system boosting health benefits and for its ability to increase recovery and healing post-workout. After every workout session there are many micro tears in your muscle fibers that need to be re-built and repaired. If you’re a hard training individual you will need to supplement zinc for optimal growth and recovery. A zinc deficiency usually goes unnoticed but it may adversely affect testosterone inhibiting muscle growth and strength gains. Those most assailable to having a zinc deficiency are athletes, vegetarians/vegans, and hard-training individuals. It is wise to supplement zinc if you’re not eating enough zinc through your diet. Raw foods high in zinc are Grass-fed Beef, Yogurt, Lamb, Pumpkin seeds, Chicken, Spinach, Cashews, Mushrooms. Optimal levels of Zinc is required to live a healthy, optimal life. Supplementation of zinc throug diet or products are both effective ways of replenishing low zinc levels. Supplementation of Zinc tends to be around 10-15mg as a daily preventative. Those who are at risk for a zinc deficiency should supplement 25mg-45mg daily. One of the best times to take zinc is 1 hour before bed time. This will give your body the fuel it needs for muscle growth, fat loss and to recovery properly from a hard days work. Its recommend not to be taken with food since certain nutrients can inhibit zincs absorption and utilization.